Some American manufacturers that once were cruelty-free have begun testing on animals in order to enter China, which requires it. If they want to enter Israel, they'll have to stop. That's because effective January 1, 2013, Israel does not allow personal and home care products--from cosmetics to detergents--tested on animals to cross its borders. Israel has prohibited animal testing within its country since 2007. But this new law takes compassion to an even higher level. It's a precedent all civilized nations should follow. It's easier than you may think. You can shop online. Or at stores in your community like Trader Joe's, which carries a good line of affordable cruelty-free products, and Whole Foods. Thank them--and encourage mainstream grocery, department store and drugstore chains to join them. 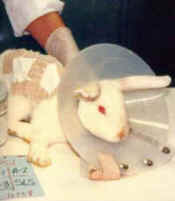 THE FACES OF ANIMAL TESTING: Animals are immobilized, irritants applied to their skin and placed in their eyes. Pain relief is not provided while the test is ongoing. Then the animals are killed. Information and photos courtesy of all-creatures.org image gallery.